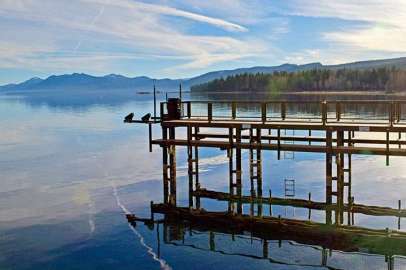 At the northern tip of Lake Tahoe is Kings Beach, known for it’s outstanding public beach, funky cabins, dining and shopping. The community has a little something for everyone with quick access to the lake, ski resorts, golf and more. The North Tahoe Event Center often plays host to festivals, concerts, and community events. One of the more affordable neighborhoods on the lake, Kings Beach – which includes Brockaway, Woodvista, Kingswood Estates and Kingswood West – are nice areas with good values. Most homes are in treed, quiet settings with some lake views and living here are primarily a full-time residents. The area also includes Brockway Springs Estates – site of the famous Brockway Hot Springs Resort Hotel – a gated lakefront community of 20 home sites on 20 acres and there is a Brockway Springs condominium developed located next door. All of these properties enjoy a year round heated swimming pool heated by natural hot springs. They also have a club house, tennis courts, deep water pier and buoy field.